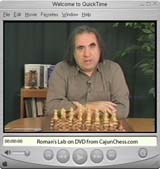 In Volume #32, Roman will teach you how to master the endgame. GM Dzindzichashvili explains the strategic and tactical nuances of an original Black defensive system beginning with 1.d4 g6 2.c4 Bg7 3.Nc3 c5 4.d5 Bxc3+!? 5.bxc3 f5 developed from the grandmaster's own tournament practice. In a companion DVD to Dzindzi Indian Defense, the author examines the consequences of White's attempts to avoid the sequence 1.d4 g6 2.c4 Bg7 3.Nc3 c5 4.d5 Bxc3!? Transpositions to Benoni-like structures (the Dzindzi-Benoni!?) and certain variations of the Pirc/Modern complex are explored from Black's perspective.